I can’t believe how long my hair has grown. This is the longest my hair has every been. And I am loving every bit of this experience and challenge. But it’s less complicate than I thought it would be. This years my health has also got better, although I never had any illness. But for me good health means more energy, strong digestion, strong joints and muscles, and peaceful sleep. When I sleep better, I need less sleep and I wake-up early for my yoga and exercise. And that in turn makes me feel more energetic and healthy throughout the day. My hair has also got better. They are growing thicker and have more shine and volume. They are also a lot silkier, just like when I was a teen (during that time I subjected it to some much chemical abuse, my poor hair, but glad I got my senses back- I have shared the story here). I have been massaging my hair one or two times a week. As I have written before, spring and summer is the best time for hair growth. The long day light causes hormonal shift (for good) and makes hair grow faster and thicker. Have you noticed any extra growth this summer?? Since February my hair has grown a total of about 15 cm. In March I had my hair cut by about 5 cm. So now I am left with hair growth of 10cm. 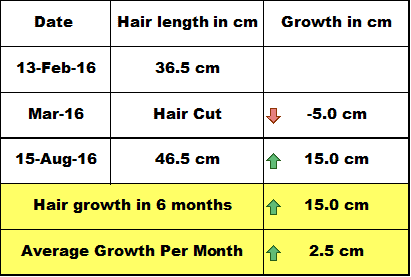 In these 6 months (February to August) my hair grew by an average 2.5 cm per month. The other two indicators I was keeping a track of were: hair loss and scalp dryness. My scalp has got a little dry in the last couple of months. I put half the blame on the store bought shampoo (natural, sls free, paraben free) that I use at times, when I go lazy and I do not want to wash my hair with the my homemade shampoo. But I have recently devised a short cut to make hair washing easy. I add 1-2 teaspoon of shampoo to my homemade egg or ree-shi shampoo. This helps to clean my hair beautifully and I don’t have to worry about the oil being left over on my hair. I put other half of the blame on the various oils I have been trying. Some of them caused my scalp and hair to dry out. So right now I am sticking to what works for me: a mix of sunflower oil, olive oil, almond oil, and castor oil, and I add a few drops of khus (vetiver) and lavender essential oil. I care more about the hair fall than hair growth (as in length), as this is what bothered me great deal and at one point I had thought I would go bald if I keep losing hair so much. This summer my hair fall has been the lowest of all time. The day I head massage I lose about 90-100 hair – this is way less than what I would lose when I initially started massaging my hair, about 200 hair. I don’t want to set any hair growing records, I am only enjoying the experience. Let’s see how far I grow. I will at some point donate my hair to Little Princess Charity, which provides real hair wigs for children who suffer hair loss due to cancer treatment. You can mix in a few drops of essential oils to go with them. Khus (Indian vetiver) oil, ylang ylang oil, lavender oil, geranium oil, rose oil, peppermint oil, juniper berry oil, and thyme oil are good choices for hot season. Blending essential oil: Since the essential oils are very strong and potent you only need a very small amount. For 2 tablespoons (15ml) carrier oil add 2 to 3 drops of essential oil of your choice. For safety and precautions of essential oils, read here. The reason I give so much importance to head massage is because of its innumerable benefits. Head massage unclogs the blocked hair follicles, brings oxygen and nutrients to hair roots, and gets rids of the accumulate toxins on the scalp. I have written in detail about the befits of head massage here. Apply the oil on your scalp in sections. Massage gently using your finger pads. Make sure you cover all areas. I also like to tap all over my scalp with my fingers – this is very relaxing and energising. Finish by running fingers through your hair. Leave the oil on for at least an hour (4 to 5 hours is ideal), then wash off using a natural shampoo. I am excited to hear how it has gone for you – Guys and Girls, everyone is welcome to participate. You can join in at any stage. Next update will be in October/November. Hi Minaz! Wow im so motivated by the amount of growth youve had! Congrats! Im definitely gonna start. Is it ok to leave the hair unwashed after massaging with oil or its important to wash it? Hi Gugsi, you can leave it unwashed, it’s absolutely fine. Hi Bhavan, is your flaky scalp oozing? 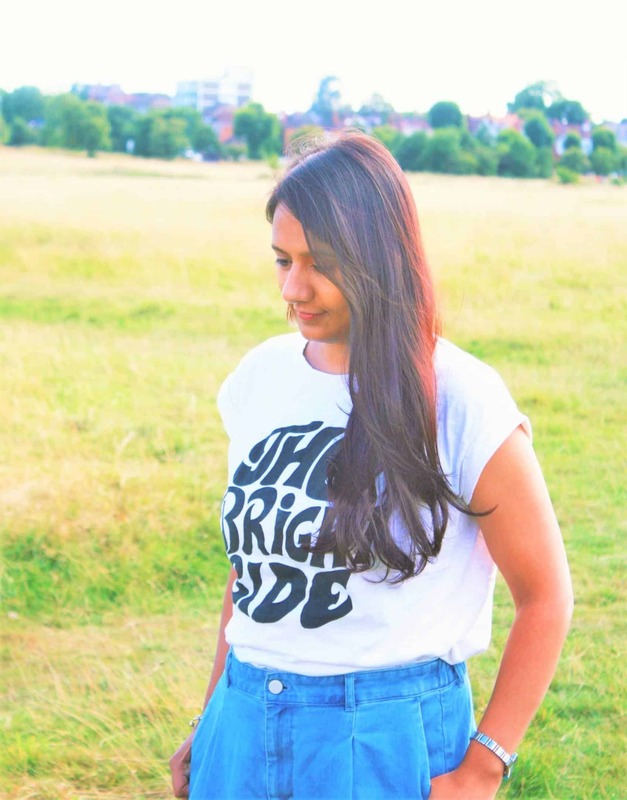 Hi, Minaz Can you let your hair get wet with water when it isn’t your washing hair day? Hi Ana Marie, I wouldn’t because it causes stress on hair – it expands when wet and then shrinks back to it’s shape. Hi Minaz.I know the Importance of head message. But I have hair loss problem If I start messaging, my hair is falling more and more.How to deal with it I’m not understanding. Just tap your scalp with your fingers and that should not cause hair loss. I have written how to do here. I started head massaging after reading ur post and got the importance of head massage. I do it 10 minutes on alternative days sometimes with oil and sometimes without oil. Now i use onion juice from the past one month. I apply onion juice on my scalp and leave about an hour before the wash. When i started my head massage the day when i do that, there was heavy loss of hair when i washmy hair. Now it has bren reduced to some extend..but my head had gone through heavy shredding which made quite a lot amount of hair to loose. Kindly provide rome suggestions for regrowth in the bald areas and also to increase the volume and silkiness. Hi Jagadeesh, keep doing what you are doing. Once a week do a miracle hair mask or egg mask and that will increase volume and silkiness of your hair. Here are more tips to regrow hair . Hey, that is some impressive growth Minaz and your hair look beautiful as well. I am struggling with hair growth but did not start the challenge when I read your previous update, although I did massag my head a couple of times and it really felt good. But I am going to start now and make most of the remaining summer. Didn’t know hair growth can be seasonal. Thanks for sharing.